…that I will not be blogging tomorrow or the day after due to Shavuot. Don’t miss me too much! …that I also won’t be online those days, which means I will still be more behind on reading blogs. …that this is another week with no time for the gym. 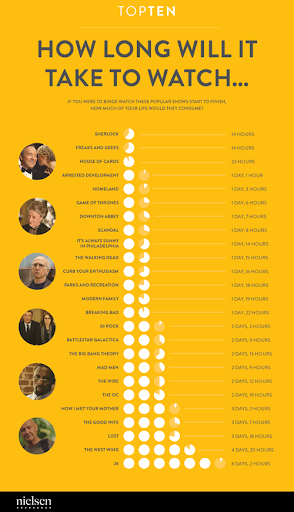 …that I find this “How Long Will It Take To Watch” chart pretty amusing. Look at all the time I’ve wasted watching TV! Of these shows I’ve only watched: Homeland, Downton Abbey, Scandal, The Good Wife, and Lost, but that’s like over a week of TV watching! …that I’m pretty excited that the kids have camp next week. What’s okay with you today?